6x7cm format lens shutter single lens reflex camera, w/interchangeable lens, film back, finder and focusing screen system. 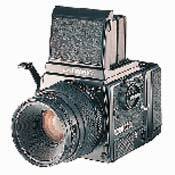 Very well-designed; relatively compact and light for a 6x7 format; huge variety of available options and interchangeable parts (lenses, backs, finders, focusing screens); very sharp optics; rock-solid feel and performance; has TTL speed light capability; reasonably inexpensive on the used market. None of any real concern. Image quality is hard to beat. Useful selection of lenses. Prices as of 2013 make it affordable. Well built and takes a beating. Bright viewfinder, controls are easy to reach and the camera is fast to use for it's size. Film and processing are not as easy to find as years back. Since it's discontinued their are no new products being designed for it and Tamron/Bronica are no longer repairing them. Parts are limited. No longer better image quality than digital. If you've always wanted one buy one. If you still have your own darkroom and process B&W, buy one. If you don't mind carrying around a very heavy camera bag and a tripod buy one. No longer exists. There are camera repair shops that still have parts but the reliability is questionable. Do your homework first. Hassy, Rollieflex, other Bronica models. 6x7 film and the option to go smaller. Good build quality but not heavy. Lenses are very good optically and mechanically, much sharper than Mamiya lenses. CA's are non exsistant on my lenses. Ergonomics not great when vertical composing. This year was the first year that I completly stopped using film at wedding. It's a shame, but as photography is constantly being devalued all the time, running a 6x6 camera I was pricing myself out the middle wedding market. I found the Brionica SQ-Ai was not an ideal format for studio work. So I sold the kit and have brought a mint condition GS-1 with rotary finder, 3 lenses, 65mm, 110mm & 150mm, all for under £700. Not the easiest camera to use, especially using it in portrait work. The lenses/ focus screen are dim, but most time I have good lighting in the studio. I might get myself a Bettie screen to over come the focus problems that I sometimes get. Most times I will use the camera on a tripod when critical focus is important, but with most other work, the camera is fine being hand held. Of course, the ultimate goal of the camera is to produce results that non of my full frame digital cameras are able to do. And believe me, this camera does not fail in this department. Along with using professional scanning equipment like Imacons, the results are breath taking. I can't see how people can say full frame digital is as good a MF. especially when photographing people. Interestingly, just a 10MP scan from a positive out resolves my Canon 5D MKII with L glass. I can't explain that but it does. However, if you want to be part of the present crowd of photographers who murder their images in photoshop with skin smoothing and blowing out highlights, then this camera is probabley not right for you. No fast lens (but DoF is thin enough at f/3.5 on 100mm), making focusing difficult in low light. Lots of good reviews for this camera are very positive. I can only approve them, since the Bronica GS-1 really is a wonderfull camera. I have been using it for three years, it has been my first medium format, and probably will remain my prefered. This is a very serious camera. First of all it is an entire system, and the camera can be made fit for different purposes : from a minimalist WLF+100mm configuration to a larger prism finder + extension tubes + lens hood + grip + flash setup where it looks monstruous. Given the proper accessories, this camera can shoot anything from candids to macro, portraits, landscape, whatever. Second, this camera is pretty straightforward, very little nonsense in its design, it really is down to the essential. Third, this camera's quality is very good. The build is very solid (although there is plastic covering over the body). Electronically controlled shutter seems very reliable. Mirror shake is very moderate. Optics are superbly sharp. In fact it is more likely for you to miss the focusing or have motion blur than for the lenses to show their weaknesses. All in all, probably the best 6x7 SLR out there if you have budget limits. Light enough to carry around on hikes, very good in the studio, no major design flaws or quality issues, a very recommended camera. Never needed it. I once fixed myself a back that had been abused. Also had to fix the lock pin hole on the AE prism. I read somewhere Tamron will support the gear until 2012. Ergonomic. Battery is not an issue. Multiple Exposure. Mirror lockup. Flash sync. 6X7 negative. A 645, 6X6, and ^x& in on system. Fairly easy to use handheld. CHEAP!!!! Slow glass and no specialty glass. No motor. No digital back capability. All of these weaknesses make the SQ or ETR series viable. For this reason I hate to do it but I rate it 4 overall, but a 5 in terms of $$$xalue. I've been sucked in by the big negative. The GS1 is a wonderful camera. With the speedgrip it is handholdable for a fair anount of time. Used witth a monopod and /when I add the waist level viewfinder it is every bit as versatile and suprisingly mobile.as any 35mm manual camera. Works nicely with a tripod. Mamiya rotating back may be really nice but a pan tilt head does just the same. I have yet to break it in at a wedding but plan to use it for formals and B+W. The GS1 is a wonderful portrait camera whether handheld or on a tripod. One must really slow down and think, I don't use a metered prism so I can't speak to the TTL abilities. It takes time to learn some of the quirks, but overall a really nice camera. The lense selection are SLOW, so if available light is your thing then the SQ might be a viable choice with its motor and f/2.8 glass. I have probably overpaid by $1000 buying minty like new from Keh, but my 3 lense/3 back setup is a suprisingly versatile. I've shot a motorcycle rally, sports, portraits, and landscape on and off the tripod/monopod. My next venture will be architecture and high end B+W portaiture. Weddings once I feel more comfortable. It can add something special to your photography and when entire systems like mine can be had for $1000, even the Canon/Nikon super digicams have a hard time competing in image quality. Durability, relitively small, excellent lenses, simple to use. No revolving back, thus harder to use for verticle composition. I have used Bronica's for 30+ years and the GS-1 for at least 10 years and it is the best of all Bronicas used by me. It really is not heavier then the 6x6's and has the advantages of a bigger negative. I actually have two bodies, the second bought used recently as a back up, as my first one is getting a bit old. However, in reality, I have no reason to believe I will have a mechinical problem. Buy used for the bargins and believe you will get good quality lenses too. I was worried when I sold my ECTL and Nikkor lenses but GS-1 lenses are equil in my opinion. Earlier Bronicas and Mamiya twin lens,Graflex 120's. The camera is a dream to operate and simpler to use than any 35mm SLR. The body has a very solid build but isn't too heavy given the 6x7 neg size. The GS-1's best strengh, however, is the images it produces. I tested this camera using Velvia 50 and E100VS chromes and the results are stunning to say the least. My eyes did not capture more detail than the film! A 10x loupe shows no grain whatsoever. Good technique (tripod, mirror-lockup) is required. The camera is small, but it isn't something you want to lug around all day. I found the leatherette peeling on the body, but a bit of glue solved that problem. Mirror slap seems a bit loud but I haven't had problems with handheld shots yet. I have nothing to compare this camera to (RZ67), so for all I know this is a very quiet mirror. Regardless, always use MLU when you can. The GS-1 is an incredible camera. The body, waist level finder, 120 back, and standard 100mm f/3.5 lens cost me a total of $650 USD on the used market, and everything was in mint condition. Take everyone else's advice and purchase it used! Not needed - doubt I ever will need it. Extremely well built. Excellent optics. Small and light enough to be carried by hand. Fantastic value on the used market. Most undervalued camera on the market. Most camera stores have limited selection of GS-1 accessories and lenses. First let me begin by saying that I have owned this camera for a little over 6 months now. This is also only the second time that I have taken the time to write a review, the first time was to share my accolades for my Nikon F 100. After using this camera for some time I have concluded that this is clearly the finest value in photography today. If you were to purchase a new Bronica GS-1 system at the current Bronica pricing you would be getting a great value. However, as many others have stated, the way to buy this camera is used. The camera and its lenses do not for some reason hold resale value. As a result you will literally steal this camera from either E-Bay or a used camera store. I have owned both a Bronica SQ-Ai and a Mamiya RZ67. I feel that the 6x7 format is truly the way to go if you want to shoot landscapes or make truly large size prints. The Mamiya while an excellent camera is just too large and heavy for any kind of field use. The optics of the Bronica system are as good as anything I have seen. I currently own the PG65mm, PG100mm, and PG200mm. I will compare these lenses against anything on the market today. When the Bronica GS-1 is used with the speed grip and AE Finder it will feel like a oversized 35mm in your hands. In summary, if you have been thinking about a 6x7 camera this is truly the best camera that your money can buy. Log onto E-Bay and click Buy It Now! No experience with Bronica service. I can't see very well through the viewfinder. Some say ML is complicated, but do not have problems. -quality -sharpness of the lenses -reliability -excellent value - easy to handhold -do not hesitate, just get one! havent used it yet, but the web site is nicely done.